For some reason Cypripedium orchids are overlooked in Australia, many species are actually easy care and given the beauty of these plants we are not sure why. These are the slipper orchids and they are a terrestrial orchid and many are from North America where they grow in woodland situations other species are from Europe and Asia and one species from Britain. With such a large range in terms of climate it is only possible to generalise in terms of care and growing conditions. 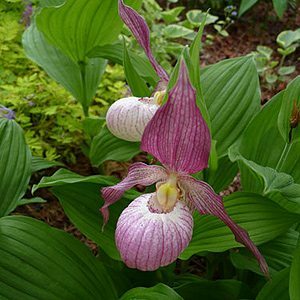 They are an orchid that likes a cooler climate, so in countries such as Mexico, Cypripedium dickinsonianum is found at elevations and in woodland areas. We are looking for a cool woodland situation but not deep shade, we are looking for a humus rich deep soil but well drained. And a position where these orchids will not be in competition with the roots of trees or other plants. Take extra care in wet winters, they really do need good drainage, so consider digging in some perlite or sharp sand to assist with soil aeration. As soome as growth commences in spring it is time to look at a little fertilzer, perhaps some liquid seaweed fertilizer, but do not over water. They do like fertilizer and most slow release fertilzers will do. These are a spring flowering orchid, they do not like to much hot weather, so you do need to look for a cool position in the garden. If your garden soil can not provide these conditions you could amend the soil to improve drainage, dig out weeds and roots to allow ‘room to grow’ or consider growing in containers or pots. Many hybrids are available with macranthum x parviflorum being a well known cross. Species such as C.acaule also known as the moccasin flower, C. reginae with its classic pink and white flowers and C.calceolus with wonderful yellow and red flowers are all sought after if a little difficult to come by. So what makes these ‘Slipper Orchids’ so wonderful ? It is the flowers which can be single on one stem or multiple. A large slipper shaped lip topped with three petals. It is the large lip that is usually coloured.